Anchorage Park School students dreamed of a native bush walk with bird feeders, weta enclosures, insect hotels and worm farms for their school. They even produced a model of what the finished transformation would look like. Thanks to $10,000 from TREEmendous – a joint initiative between Project Crimson and The Mazda Foundation – that dream became a reality, last Saturday. Mazda Ambassadors, Riley Elliott, Peter Wolfkamp and Boh Runga worked tirelessly alongside teachers, pupils and parents, local community members, Mazda Foundation Trustees and the team from Project Crimson, turning an unused area on the school grounds into a dedicated outdoor learning space. They planted over 2000 native plants, shrubs and trees to create a place of exploration. 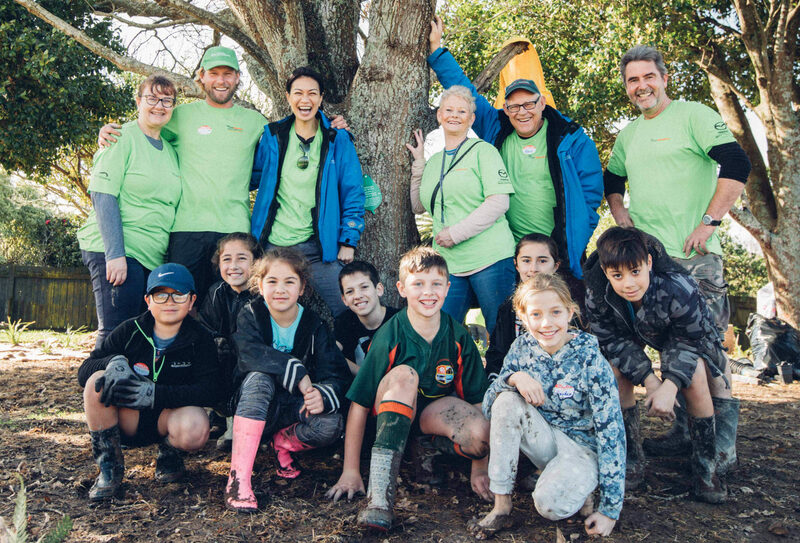 School Principal Belinda Johnston hopes that turning previous bare grass into a space where the students can learn more about ecosystems through hands-on experience will inspire a lifelong care for the environment in the children. “It’s easy for kids to just zone out when we teach them about the environment in a traditional classroom. Having a hands-on learning space will help them to really understand and connect with ecosystems of our local environment. Johnston also thanked staff members as well as the wider community who lent a helping hand. 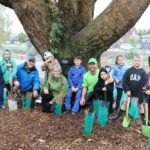 Ruud ‘The Bugman’ Kleinpaste – Ambassador for TREEmendous and Project Crimson Trustee, says the school’s passion for the environment was inspiring, and their strong sense of community was clear from the people that turned up on the day to help out. Ahead of the TREEmendous event the students were treated to a day of learning and Nature-Time stories from Ruud and Riley ‘The Shark Man’ Elliott. Ruud introduced his insect friends to the pupils and teachers and spoke with the students about native bugs and how they help us, while Riley explained how he overcame his fear of sharks and why it was important to take better care of our oceans. 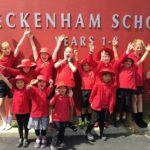 Anchorage Park was the final school to be visited by the TREEmendous team this year, Clifton School in Bulls was visited in April, Trentham was visited in May and Beckenham Te Kura o Pūroto in June. This event marks the 44th school to get the TREEmendous treatment in the last 11 years! Applications are held annually and judging is now underway for the next TREEmendous Schools for 2019. For more information visit http://treemendous.org.nz/ and keep an eye out for applications re opening early next year.